Victoria, the Eternal Empress, has sat the throne of the British Empire for over 150 years. Her policies have brought peace to the world by suppressing the development of “dangerous technologies”, and where that has failed, her Imperial Troops, with their lightning rifles, have swiftly brought order. But there are still those who chafe at the yoke of peace. When an evening’s entertainment in the British Protectorate of Bohemia unexpectedly leads to the destruction of the State Opera House of Prague, the eccentricity brilliant Professor Harmonious Crackle and his beautiful colleague Miss Titania Bang must team up with the Duke of Prague’s nephew and hunt down the evil genius responsible. Can they find him and stop him before he unleashes his new technology to terrorize the city and threaten the stability of the British Empire, and the Eternal Empress herself? In a race against an unknown menace, this intrepid trio must search high and low and discover The Perils of Prague! “You’re serious!” Miss Bang’s brow was creased in ire. The hint of fire blazed behind her eyes. “I don’t believe anyone ever accused my great-grandfather of having good taste,” I commented ruefully. I nodded. “Yes, Professor. It was just earlier this morning.” I wondered if it was still morning. “At the opera?” I asked. I wasn’t quite sure where he was leading. “Yes! Did you get a good look at them?” He seemed very agitated as he leaned toward me for my answer. “And you, Titania?” He whirled to face Miss Bang. “Drat. I hoped one of you got a better look. Now we shall have to find what is left of them.” The professor moved back to his workbench and put down the wing and his loupe. “You want to go find their bodies, Professor? Isn’t that a task better left to the police?” I did not fancy the idea of sifting through the rubble for pieces of the dead performers. “A clockwork man? How is that possible?” I looked to Miss Bang, but she seemed fascinated by the idea. “So, we’re going back to the opera house?” Miss Bang asked. “Surely he will be worried about my disappearance? Perhaps it would be best to just drop me off first and I can explain your theory to Uncle Randolph?” Much as I would like to avoid his wrath, putting off seeing my uncle could only make things worse. “And the police, Professor?” I asked, wondering what Inspector Janecek would think about the professor’s clockwork people theory. “But, but that’s not what I meant!” I sputtered and hurried to catch up to Miss Bang as she swept out of the room in the professor’s wake. Doc Coleman began his writing career in 2010 with the Nifty Tech Blog, a tech review blog that demystifies technology by highlighting some of the best consumer products available. Doc soon moved on to writing fiction, with the short story “The Gift”, and stories for the online magazine Flagship and for The Ministry of Peculiar Occurrences’ podcast Tales from the Archives. His latest work is the first book of his steampunk series The Adventures of Crackle and Bang, The Perils of Prague. Doc is a computer geek, a motorcyclist, a homebrewer, a podcaster, a writer, and voice actor. Sometimes, he even finds some time to relax, too. 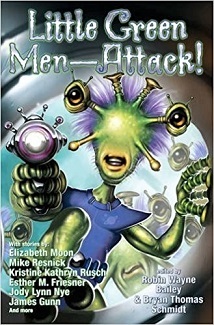 M ichelle reviews Little Green Men–Attack! edited by Bryan Thomas Schmidt and Robin Wayne Bailey, a collection of 18 new stories and 1 classic reprint from Baen. From psychic cats to french-kissing aliens, Baen’s Little Green Men–Attack! offers up a variety of laughs from seasoned story tellers and editors. Get it now! Tales of Arilland is special to me because “Blood and Water” is the first story I read by Alethea Kontis, and I’ve been fan squee-ing after her ever since. 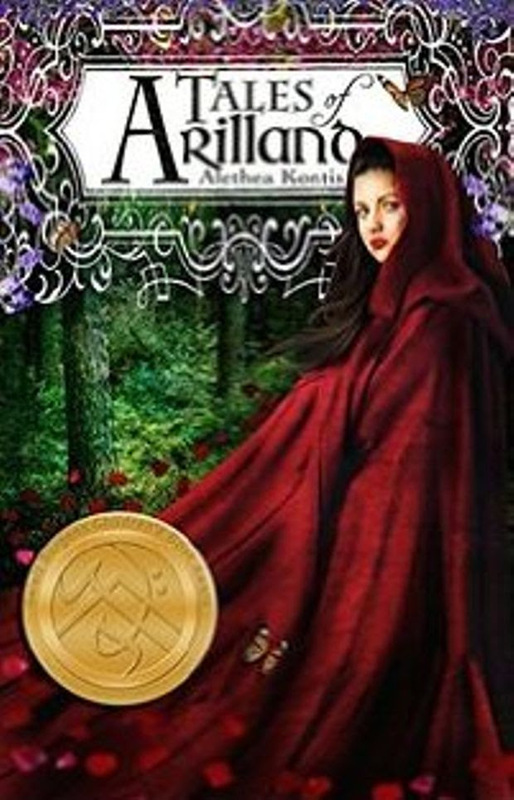 Alethea Kontis’ 2015 Gelett Burgess Children’s Book Award Winner, TALES OF ARILLAND IS JUST $.99 FOR A LIMITED TIME! In the fairy tale realm of Arilland, stories are told at children’s bedsides–and not the stories you think you know. Tales of Arilland is a collection of fairy tales, presented in the magical topsy-turvy way that only Alethea Kontis can do. Discover the story of Bluebeard’s first wife (“Blood From Stone”), what really happened to Snow White in those dark woods (“The Unicorn Hunter”), how dangerous the Little Mermaid might have been (“Blood and Water”), and just how far Little Red Riding Hood was willing to go (“Hero Worship”). Included in this collection is “Sunday,” the original novelette that inspired the award-winning novel Enchanted, as well as “The Cursed Prince,” the previously untold history of Prince Rumbold of Arilland…and more. Purchase your copy from any of these platforms! What an exciting month. We have several book releases to share with you. PJ Ballentine’s Immortal Progeny just released and is now available in paperback! You can listen the first chapter here on her blog. For generations the world of Rahvas has been awash in holy war between its many temples. 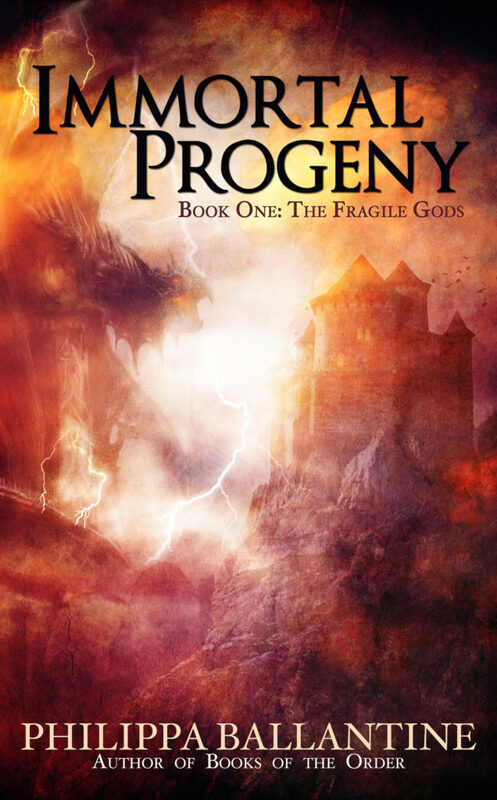 Priests and priestesses have built towering monsters to destroy one another and prove their deity the One True God. But those temples also made two mistakes. When three little girls came out of the void where Gods are born, they mistake them for humans and let them live. Separated, Rowan, Vervain and Amaranth have lived out very different lives. One lived as a temple acolyte, another as meat for the creation of progeny, while the third learns the magic of the atheists. As the sisters’ power unfolds and they learn the truth of who they are, the temples and all those that fight for them will find a new war on their doorstep. Rahvas will become the battleground between gods and monsters. 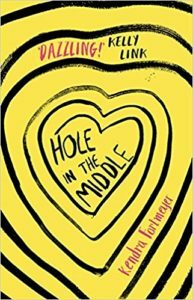 Kendra Fortmeyer’s HOLE IN THE MIDDLE is now available for pre-order for its July 6th release date (2017)! HAVE YOU EVER FELT LIKE A PART OF YOU IS MISSING? Morgan’s sick of living with her secret. She was born with a hole in her middle: a perfectly smooth, sealed fist-sized chunk of nothing where a stomach ought to be. After seventeen years of hiding behind lumpy sweaters and a smart mouth, she’s fed up. But when she bares all, the fallout is more than she bargained for. A few photos snowball into a media frenzy, and suddenly Morgan’s desperate to get back to her own strange version of normal. But between the hospital visits, the internet celebrity, and a disintegrating relationship with her best (and only) friend, normal is slipping farther and farther away. Then a new doctor appears with a boy who may be both Morgan’s cure and her destiny. What happens when you meet the person who is – literally – your perfect match? Is being ‘whole’ really all it’s cracked up to be? HOLE IN THE MIDDLE explores the hard truths of being a young adult in a world obsessed with body image, instant fame and unlikely love stories. Do writers need writing degrees? Or, if you want to be more generous, do writing degrees help make a writer? The short answer to the first question is “No.” We don’t need writing degrees to became great writers. So then, what DO writers need to improve their craft, and how do college classes factor into this? I have a BA in Psychology with a Spanish minor, so I have my own opinions about colleges and degrees. Overall, I enjoyed college and can’t quite bring myself to say that I wouldn’t go if I had to do it all over again. What I never liked, though, was the number of classes required that didn’t relate to my degree–I consider that bloat. I think the point here is that you have to learn by doing and by interacting with and learning from other people. College classes can be both, because I sure remember writing short stories and critiquing in Creative Writing class. Writing retreats can be both. (KT Byski also posted about how much she got out of the Smoky Writers Retreat). Then there’s writers and critique groups. The question, then, is not what a hypothetical writer needs to improve their craft, but what YOU need to grow as a writer. There’s so much out there! Update: HOLE IN THE MIDDLE cover and release date! Kendra Fortmeyer’s Hole in the Middle now has a cover and release date, so go add it on Goodreads! She also has new original fiction in Lightspeed and Apex, and a reprint of “Asymmetry” in PodCastle coming this spring.